go to https://unitedid.org and use the Sign Up ﻿button. You will be taken to an account creation form. Fill out the required information. Please use a password that you do not use for any other login. Then click the SIGN UP button. 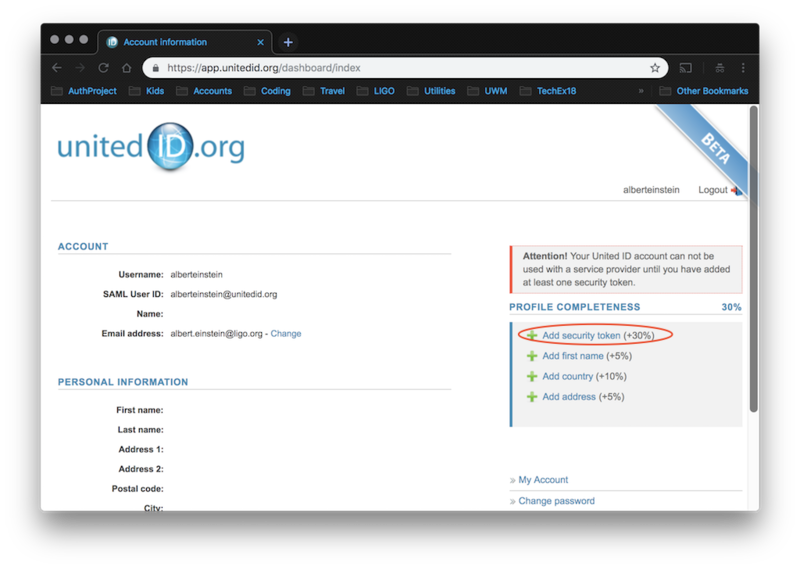 To verify your email address, UnitedID will send an emai to the address you provided with a link. 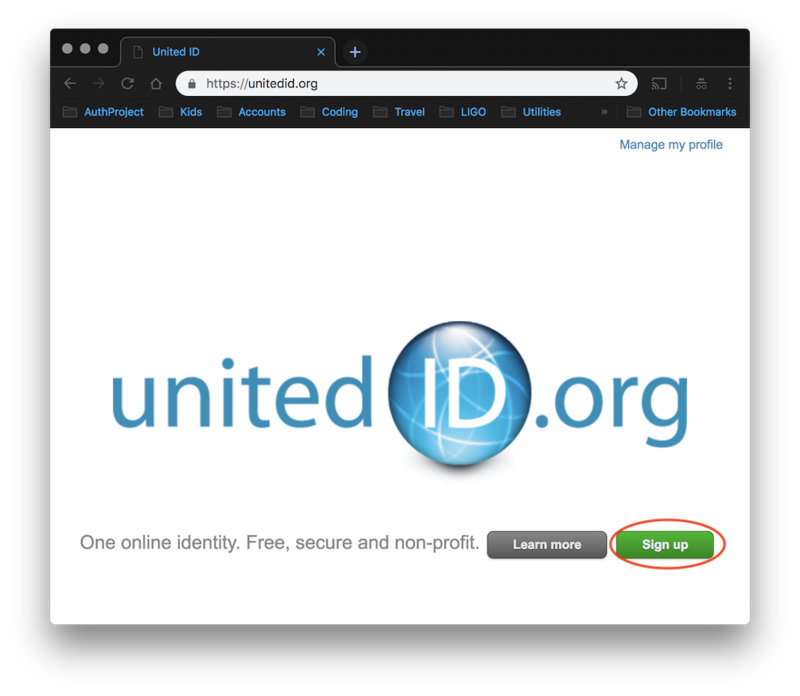 Click the link to complete the creation of your UnitedID account. This complete the account creation, but you cannot use the account to login until you enable a security token. To do so, go back to https://unitedid.org and use the Manage my profile link at the top left. 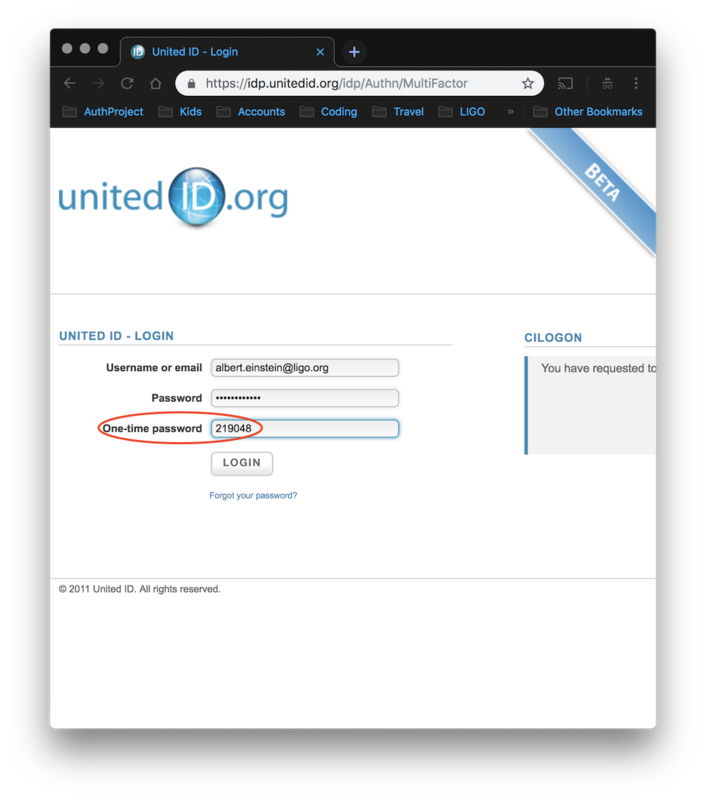 Login to your UnitedID account using the email address and password you used to create the account. You will be informed that your profile is incomplete in a number of ways. The only items that must be completed are your to use your account are Add First Name (you must add both your first and last names on this form, but nothing else is required)and Add security token. 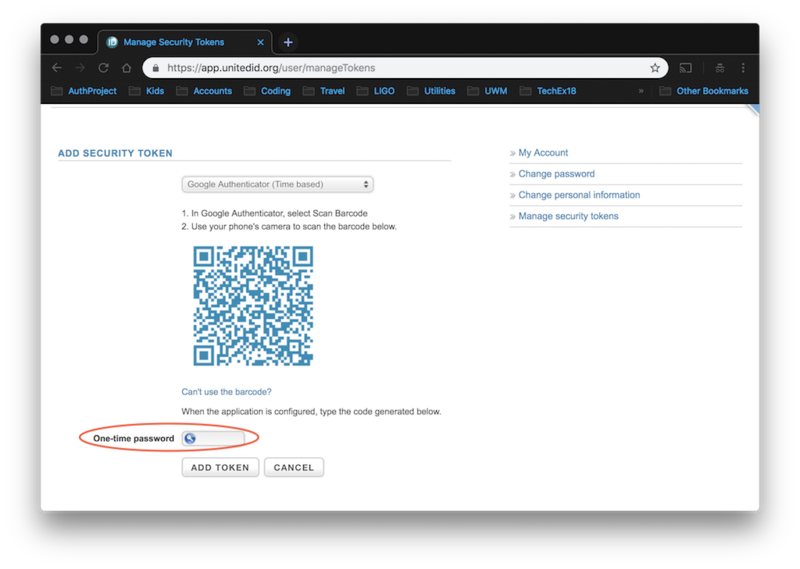 When you click on the Add security token link, you will be taken to a page with a drop-down menu of options. The easiest option for most users will be Google Authenticator. We recommend selecting the Google Authenticator (Time based) option (you should also be able to use counter based, but it is more prone to problems). Select that option and then proceed to the next page. To use Google Authenticator to create security tokens, you must have a mobile device (smart phone or tablet) that can run the Google Authenticator app. Go to the appropriate app store for your device (Google Play Store for Android, Apple App Store for iOS) and download the free Google Authenticator app. In the app, you will see a "+" button at the bottom right, to add new accounts to Google Authenticator. Use that button select the option to use a QR code to create the new account and it will activate the camera on your device. On your computer screen, you should see the webpage below, with a QR code on it. Use your mobile device to scan the QR code. This will create a new UnitedID account in Google Authenticator. Once that is complete you will see a six digit code in the app. That code changes every 30 seconds. Shortly after it changes (a few seconds) it expires and cannot be used any more. Type the six digit code into the One-time password box on your computer screen and click the ADD TOKEN button to complete the synchronization of your UnitedID account with Google Authenticator. You will be sent another email to the address you provided to UnitedID, asking you to activate your new security token. Click on the link and you will be taken to a web form where you must once more enter a six-digit code from Google Authenticator. Complete that form and your UnitedID account will be ready to use. 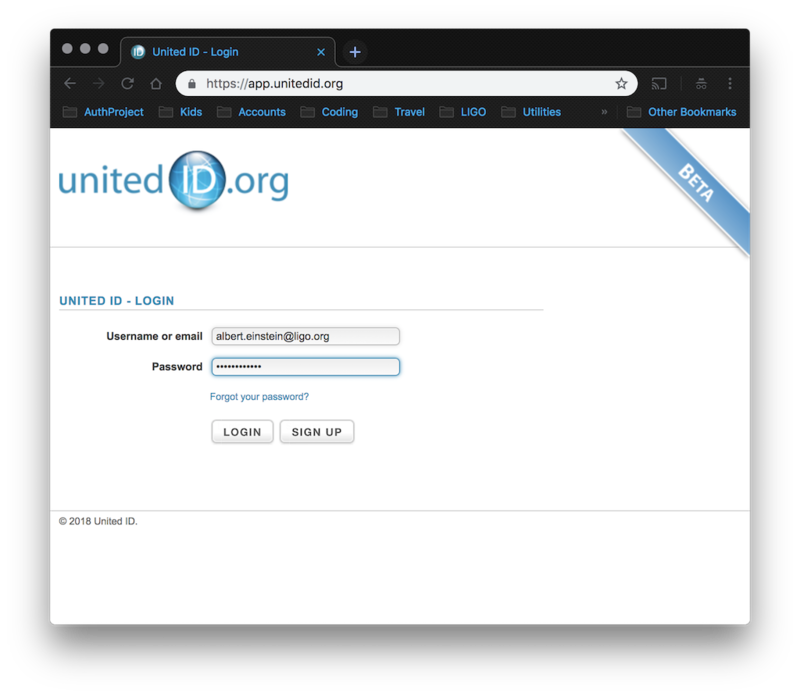 You can now login using your UnitedID. Remember that to complete your login, you will need to have Google Authenticator open on your mobile device and you will need to enter the six-digit code from the app into the One-time password field in the login form (not 219048, that is just an example).